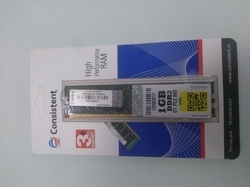 We deals in 1GB ddr 2 ram in delhi and other states in india. FBDIMMs have virtually unlimited scalability of density & high bandwidth. It is so possible, as it has AMB (Advanced Memory Buffer), which provides hi-speed information interface, while also reduce soft errors. FBDIMM DDR2 Memory is an ideal memory solution for the Mac Pro. By utilizing “Advanced Memory Buffer, Fully Buffered DIMMs maintain strong signal integrity as well as improve error detection methods that reduce soft errors. Backed by a rich industrial experience, we are engaged in offering a commendable array of DDR2 RAM. Samsung DDR2 RAM has excellent range that gives better performance with lower power consumption in desktops.